Although much ink has been spilled on ISIS’s activity on Twitter, very basic questions about the group’s social media strategy remain unanswered. In a new analysis paper, J.M. Berger and Jonathon Morgan answer fundamental questions about how many Twitter users support ISIS, who and where they are, and how they participate in its highly organized online activities. 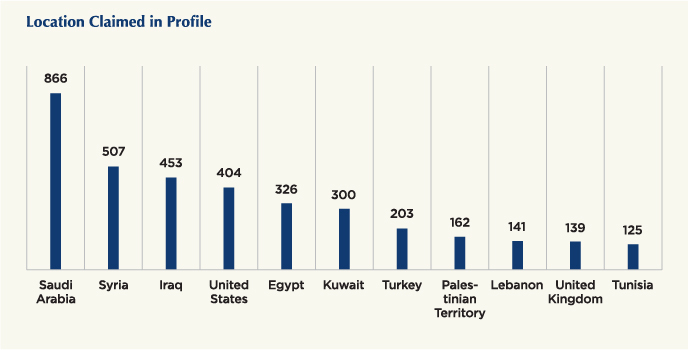 Previous analyses of ISIS’s Twitter reach have relied on limited segments of the overall ISIS social network. The small, cellular nature of that network—and the focus on particular subsets within the network such as foreign fighters—may create misleading conclusions. This information vacuum extends to discussions of how the West should respond to the group’s online campaigns. Berger and Morgan present a demographic snapshot of ISIS supporters on Twitter by analyzing a sample of 20,000 ISIS-supporting Twitter accounts. Using a sophisticated and innovative methodology, the authors map the locations, preferred languages, and the number and type of followers of these accounts. • From September through December 2014, the authors estimate that at least 46,000 Twitter accounts were used by ISIS supporters, although not all of them were active at the same time. • Typical ISIS supporters were located within the organization’s territories in Syria and Iraq, as well as in regions contested by ISIS. Hundreds of ISIS-supporting accounts sent tweets with location metadata embedded. • Almost one in five ISIS supporters selected English as their primary language when using Twitter. Three quarters selected Arabic. • ISIS-supporting accounts had an average of about 1,000 followers each, considerably higher than an ordinary Twitter user. ISIS-supporting accounts were also considerably more active than non-supporting users. • A minimum of 1,000 ISIS-supporting accounts were suspended by Twitter between September and December 2014. Accounts that tweeted most often and had the most followers were most likely to be suspended. • Much of ISIS’s social media success can be attributed to a relatively small group of hyperactive users, numbering between 500 and 2,000 accounts, which tweet in concentrated bursts of high volume. Based on their key findings, the authors recommend social media companies and the U.S government work together to devise appropriate responses to extremism on social media. Approaches to the problem of extremist use of social media, Berger and Morgan contend, are most likely to succeed when they are mainstreamed into wider dialogues among the broad range of community, private, and public stakeholders.